We think letting sleeping dogs lie is a pretty good idea. DixieLee is not as good a sleeper as I am. I go to sleep and sleep soundly all night, except if she kicks me. If she kicks me I move from the big bed and go to sleep on the couch so I don’t get kicked again. Lots of dogs cry or make other noises when they sleep. 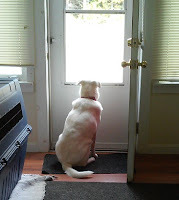 Dad thinks that DixieLee cries because she is remembering how bad her life was before she came to live with us, but it could be because she wasn’t able to chase the squirrel she saw in the yard today. Either way, we shouldn’t wake her up. Dogs sleep like peoples do. They have REM sleep times too. REM is part of the sleep cycle and when we are in REM sleep we might cry, whimper or even growl. We might move our feet, which looks like we are running. We might move our eyes even though they are closed or we might twitch our noses. Sometimes, DixieLee’s whole body wiggles. Like I said, she is not a good sleeper. If you are not a good sleeper and your humans want to wake you up, go sleep on the couch or some other comfy place where they can’t bother you. Wishing you pleasant dreams and I hope you catch that squirrel. Mom says it’s a god thing that DixieLee and I are cute ‘cuz we are very expensive to keep. I never thought about how much it costs to have a pet. I knew that pure breds and designer dogs cost lots to get but peoples have to give money to shelters if they want to get a good dog like me. DixieLee was a stray that ended up at a friend’s house so we didn’t have to pay to get her but we had to pay to have her spayed, micro chipped and get all her shots. This month we had our annual vet checks and had to get our town licenses. I was sick and had to go to the vet again. Tests, medicines, special food, all cost too. Food, now there’s something we need lots of and don’t forget the cookies. We order huge bags of food and a super big box of cookies that get delivered right to our house. Mom says that’s because we are spoiled. Toys are important too. We need lots of toys. And other stuff like collars, leashes, halters, bowls, crates, a fenced-in yard. Those all cost money. I didn’t realize I had so much stuff! I bet you have lots of stuff ‘cuz you’re spoiled too. We can’t go out to work like Mom does but we work very hard all the same. It’s our job to make sure Dad knows when the mail person comes or when a big truck drives by our house. We keep the squirrels from getting close to the house and we watch over the birds while they are eating out of the feeder. Those are all really important jobs but we have other jobs. Our most important job is make sure our Mom and Dad have lots of kisses and cuddles. Mom says we are expensive to keep but that we are worth every penny. Time to go back to work. Another important job is napping on the sofa so that no one can steal it. DixieLee has done her shift, now it's my turn. Mom says the sound of a dog vomiting gets a human out of bed faster than any other sound. One night last week Mom and Dad didn’t get any sleep at all. I didn’t know my tummy was so full until I was sick four times. Since I had just had my annual physical and I didn’t have any other signs of being sick, Mom though it was because I had been eating my food too fast. She checked with my Vet and sure enough, eating too fast can make air go into your tummy and cause all kinds of problems. Eating too fast can also make it easier to choke on a piece of kibble or cause bloating which can make you died! We had to find a way to make it so I didn’t eat so fast. How could I not eat fast when I am starving all the time. I suggested extra cookies between meals but Mom wasn't buying it. Mom looked for other ways. The best way was to make it harder for me to get so much food in one bite. She started by putting a toy ball in my bowl. It was annoying because I had to move it around and couldn’t eat fast. Dad also forgot to put it in the bowl when he fed me so we needed something else. If you use the ball in the bowl trick, you want to make sure the ball is big enough so you can’t swallow it! Some peoples use muffin tins. They put a little food in each part so you’d have to stop when you went from one little part to the next. They also make all kinds of “slow feeder” bowls. Mom bought one kind but the design made the spaces so small, I couldn’t get my muzzle in easily. DixieLee got one too and she got so frustrated that she tried to paw it over. When that bowl didn’t work, Mom got a different kind. This one worked better. I could get my mouth around the food but had to move from one place to another, which did slow me down about the same as putting putting a ball in my regular dish. As far as DixieLee was concerned, it was still a stupid bowl and she easily managed to flip this one over. She said eating off of the floor was much better. If you are a fast eater, what does your human do to slow you down? This week we honored sled dogs. These are hard working dogs that live in places like Alaska. Alaska is a really, really big place and there are lots of places where there are no roads. Sled dogs help peoples get food and fuel from one place to another. There are all kinds of dogs that work hard for peoples. Some do dangerous work like those who look for bombs or drugs or help police get bad guys. These dogs have lots of training. There are other dogs that work hard helping their companions lives better. We think every dog makes our families better but the dogs I am talking about have special jobs. Like Service Dogs. Service Dogs are trained to help peoples who have disabilities. People who can’t see or hear, have mental problems, or have sicknesses like seizures or diabetes. Service dogs help make these peoples’ lives easier by helping a person who can’t see walk outside or one who can’t hear know when the phone is ringing. Another helping dog is the Companion Dog. Their job is to be the bestest friends to their peoples. Companion Dogs are sort of like Emotional Support animals. I say animals because cats make good Emotional Support animals too. Emotional Support animals help people who have emotional or mental health issues. Then there are Therapy Dogs. Therapy Dogs are trained to give comfort and love to peoples who are in hospitals, nursing homes, hospices or who lived through a disaster like fire or flood. They also visit schools and libraries where childrens go. So, even though we all give love and comfort and help our families, there are dogs have these special talents and we give a big paws up to them. Mom works hard to make sure that DixieLee and I are healthy and happy. I bet your Mom does too. Poor DixieLee has had the itchies for a long, long time. Our old Vet said to give her a peoples medicine called Benadryl. Our new Vet said to give her another peoples medicine called Loratadine. Even after a long time, she still has her itchies. Then Mom read that CBD, something that she takes sometimes for chronic pain, works for itchies. We did some research and CBD is supposed to be helpful for lots of hurts. She also read that CBD is good for dogs as well as peoples. I don’t understand some of the words but Mom does so I will let her explain what she read. CBD is a compound that is found in the cannabis plant. Most peoples know that the cannabis plant is where marijuana comes from. But what they maybe don’t know is that CBD comes from a different kind of cannabis plant and it is non psychoactive, which means you don’t get high. Some of the good things about CBD is that it is safe to use, non-toxic, which we think is really, really good, and it is not expensive. CBD is supposed to be good in helping make things like big pain, arthritis, anxiety, stress and seizures be less. Since I am getting a little older, I am taking CBD to help me not hurt from any arthritis and I do sometimes get stressed out. You would too if you lived with DixieLee. I know some of our friends have been taking CBD for arthritis already. Do you take it, and if you do, what for? I would like to know if it helps you and if you have anything bad to say about it. Sharing information is the biggest reason I write my blog and having you share information back is helpful. Social Media is a great way to get humans to help lost pets find their ways home and for shelters to let peoples learn about the animals that are looking for forever homes. I read a story about one of Mom’s friends from where we used to live, who drove his car a long way to adopt a senior dog whose human died. It was sad enough for this dog to not have his human anymore but no body wanted him so he had to go to a shelter and we all know that senior dogs have a harder time getting adopted. He found a great forever home because the shelter told his story on FaceBook. DixieLee and I were both adopted because Mom saw our faces on Social Media but this post isn’t about Social Media. It’s about shelters and pets looking for good, loving homes and what you can do to help. Maybe there are reasons you can’t ADOPT but maybe you could FOSTER. Shelters are so crowed, FOSTERING gives an animal a nice place to live while waiting to get adopted. If you can’t FOSTER, maybe you could SPONSOR. Sponsoring means giving money to go toward the care of a specific pet until they can be adopted. Sometimes animals need surgery or expensive medical care and sponsoring can really, really help. If you can’t SPONSOR, maybe you could VOLUNTEER. Volunteering means you give your time to a shelter. It could be helping care for the animals, like walking dogs or cleaning cages or it could mean giving your time stuffing envelopes for a fundraising campaign. If you can’t VOLUNTEER, maybe you could DONATE. Donating means giving money to a shelter. It doesn’t have to be lots, every penny helps. And Mom says that donations are tax deductible, which I guess is a good thing. If you can’t DONATE, you maybe could EDUCATE. Educating is what I am doing now. If you don’t write a blog, maybe you could share this post or you could find good animal pages on FaceBook and other Social Media sites and share their posts. There are so many animals that need humans to help them find good, safe, loving homes and now you know so many ways that you can help. Thanks from all the animals looking for forever homes. Hello there. I know, I haven’t been good at keeping up with the blog. I apologize. It’s been crazy busy this Holiday Season. I helped Mom while she was making all the gift baskets. Keeping DixieLee from getting under foot was a full time job. Now that things have slowed down I can get back to writing regularly. As a matter of fact, that is one of my New Year’s Resolutions. I love all of my on line friends and I love keeping in touch with you, sharing ideas and hearing about your lives. This blog lets me do that. It’s also a way to discuss things that are important to dogs. New Year’s Resolutions are more of a peoples thing but I think it is important that we pets reflect on our lives and see where we can make them better. Lots of peoples make resolutions to get more exercise and eat better. I think that is a great resolution and I am going to help Mom and Dad keep that one, even if it’s not one they choose. I am going to make sure that they get out and take big walks every day. We may have to wait until the weather gets warmer, but I will make sure it happens. I will also make sure they eat better. That’s also an easy one. Whenever they start eating stuff that isn’t “healthy” like potato chips, I will stare and stare until they feel guilty and put the bag away. I explained New Year’s Resolutions to DixieLee and she is making resolutions to stop stealing socks and to stop eating paper towels. Stealing her socks is a good way to get Mom moving in the morning but we decided that throwing a toy works good too. As far as eating paper towels, I have tried to tell her that it is bad, bad, bad for her tummy and stealing them off of the counter makes Mom not happy. She said she was going to try really, really hard to do better. Have you decided to make a New Year’s Resolution? Let us know what it is so we can share what is important to the health and well being of our friends.